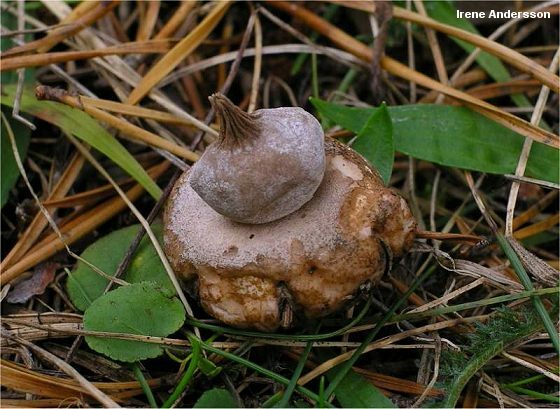 This small to medium-sized earthstar appears in eastern North America and can be recognized by its deeply grooved beak, the fine granular coating covering the spore sack, and the fact that young specimens feature a coating of mycelium on the outer surface, which picks up a substantial amount of adhering debris that can later be found on the undersides of the mature earthstar's arms. 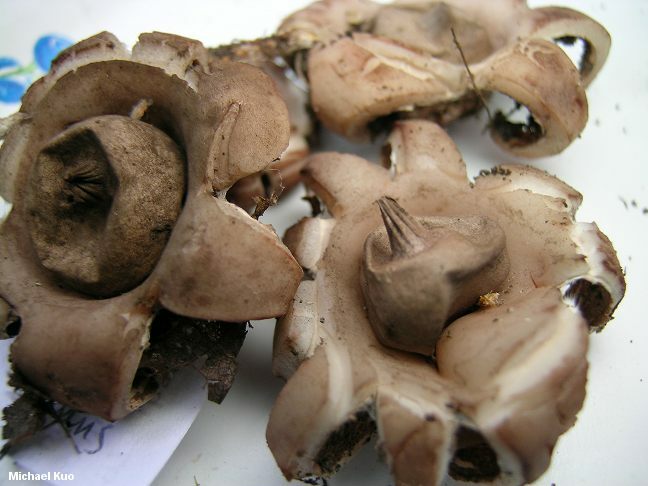 Geastrum badium is a synonym, as is Geastrum umbilicatum in the sense of Morgan. Ecology: Saprobic; often found in sandy soil; growing alone or gregariously under hardwoods or conifers; fall; eastern North America. Fruiting Body: At first a round to egg-shaped ball 1-2 cm across, partially submerged in the substrate, covered with mycelium that picks up sand and debris; with maturity the outer skin peeling back to form 5-7 buff colored to brownish, hygroscopic arms; spore case more or less round, covered with fine granules that are initially whitish but become brownish, pale tan to brownish, with a deeply grooved conical beak that is often surrounded by a brown area; 2-4 cm across when arms are opened; interior of spore case initially solid and white but soon powdery and reddish brown. Microscopic Features: Spores 3.5-4.5 µ; round; spiny; brown in KOH. Capillitial threads up to 6 µ wide; brownish in KOH; partially incrusted.